Interviewed the on February 6th by the BBC Inside Out London to know the effect that names have in the job selection of candidates. Interviewed on Deutsche Welle (the global German English-language TV station) on migration and integration. Modood, T. (2016) 'Multiculturalism can foster a new kind of Englishness' The Conversation, 10 June. Reposted on The Optimistic Patriot; reposted in PolicyBristol. Meer, N. and Modood, T. 'Birleşik Krallık’ın Dinî Çoğulculuğunda Müslümanların Yeri', Perspectif, Temmuz, 2016. 'Merkel is wrong – demanding Syrians assimilate could backfire', The Guardian, December 17, 2015. 'Schools need to do more to improve children’s religious literacy', in The Conversation, December 7, 2015. 'Universities should rethink secularism to deal with religious diversity', in The Conversation, November 17, 2015. Hard Talk interview on Multiculturalism on BBC Persian TV, April 21, 2015. Persion version also available here. 'Multiculturalism in 2020', PolicyBristolHub, April 15, 2015. Interview for Broadcasting House, BBC Radio 4, on ‘Je suis Charlie’ and French secularisms, on January 11th, 2015. Interview on TV Ontario, January 9, 2015. Debate with Carlos Tonere, PEN President, BBC Radio 5 Live, in relation to Charlie Hebdo and free speech, January 8, 2015. Interview for Newshour, BBC World Service, on Charlie Hebdo and free speech, January 9, 2015. Interview for ITV News At Ten, on ethnic minority demographic changes in Britain, screened on 6 May, 2014. Interview for BBC Inside Out West, which looked at anti-Muslim discrimination in Bristol, screened on 28 October, 2013. ‘Multiculturalism and the Nation’, Labour List, 16 November, 2012, and Global Governance Programme, European University Institute, 20 November, 2012. (with V. Uberoi) ‘Just because we are Multicultural does not mean we lose our National Identity’, Politics.co.uk, 14 November, 2012. (with V. Uberoi) ‘Making it easier to be British’, Huffington Post, 8 November, 2012. ‘Secularism in Crisis? Muslims and the challenge of Multiculturalism’, Australian Broadcasting Corporation (Religion and Ethics), 8 August, 2012. ‘Multiculturalism: Not a Minority Problem’, The Guardian, 8 February 2011. Interview with Tariq Modood on books on Multiculturalism’, The Browser, 1 December, 2010. ‘Force for Good’, Eastern Eye, 5 November, 2010, p. 6. ‘Multiculturalism is Not Dead in the UK’, The Guardian, online, 6 October 2010. ‘Author: In Defence of Multiculturalism’ by Sofia Mitra-Thakur, Eastern Eye, 1 October, 2010, p. 6. ‘We Need a Multiculturalism of Hope’, The Guardian, Comment is Free, online, 24 September, 2010. Daniel Feix, ‘Cruzada Contra a Intolerancia’, article from the Fronteiras do Pensamento Copesul Braskem Conference, 25 October 2008, Brazil. Daniel Soares, ‘A Voz do Multiculturalismo’, Correio do Povo, 25 October 2008, Brazil. ‘Filosofia e Racismo em debate’, untitled Brazilian newspaper, 27 October 2008. Daniel Soares, ‘Terra Estrangeira no fronteiras do pensamento’, Correio do Povo, 27 October 2008. Daniel Feix, ‘Diversidade cultural e destaque no’, article from the Fronteiras do Pensamento Copesul Braskem Conference, 28 October 2008, Brazil. Daniel Feis, ‘Para Entender o presente, e preciso conhecer o futuro’, Zero Hora, 28 October 2008, Brazil. Luiz Gonzaga Lopes, ‘Muito alem da etnia e das fronteiras’, Correio do Pova, 28 October 2008, Brazil. 'O multiculturalismo está morto?' Zero Hora, Porto Alegre, 24 October 2008, Caderno Cultura. 'Universities and Public Benefit', 100: A Collection of Words and Images to Mark the Centenary of the University of Bristol, Bristol: University of Bristol, 2008, pp. 245-247. ‘We Should Make Space for Others in the Quest for Integration’, Yorkshire Post, 23 July 2007. ‘Multiculturalism’s civic future: a response’ (A response to six commentators), OpenDemocracy, 20 June, 2007. ‘Multiculturalism and Nation Building go Hand in Hand’, The Guardian, p.32, 23 May 2007. ‘Multiculturalism, Citizenship and National Identity’, OpenDemocracy, 16 May 2007. ‘ID-ology’: Review of ‘Identity and Violence: The Illusion of Destiny’ by Amartya Sen, Catalyst, 15 January/February, 2007, pp. 32-33. 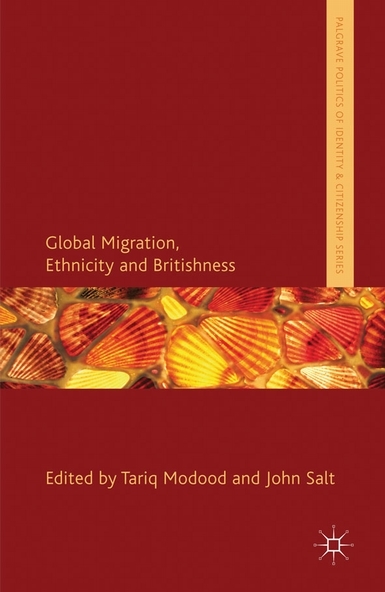 ‘Multiculturalism or Britishness: a false debate’, Connections, CRE Quaterly, Winter 2004/05, pp. 8-9. ‘Defined by some distinctly hyphenated Britishness’, Times Higher Education Supplement, 3 September 2004, pp. 20-21. ‘Europe Must Face Challenge of Giving Muslims Their Voice’, Bristol Evening Post, 22 April 2003, p. 17. ‘Faces of the Future: Tariq Modood', by Melanie Greenwood, Seven, Bristol Evening Post Magazine, 19 April 2003, p.11. ‘Q &A: Professor Tariq Modood’, Seven, Bristol Evening Post Magazine, 19 December 2002. ‘Should the Church be Disestablished?’, debate with Colin Buchanan, Bishop of Woolwich, The Guardian, 15 April 2000. `Labels won't Stick', The Guardian, 28 May 1997. `Changing Ethnic Identities', Dialogue, March 1995. `Muslim Pride: Power to the Dispossessed and Disadvantaged', The Guardian, 17 June 1995. `Ethnicity and Complexity', Challenge, Change and Opportunity, The Runnymede Trust, Jan 1995. ‘Subtle Shades of Student Distinction', Times Higher Education Supplement, 16 July 1993. ‘Wanted: A Positive Identity for Asians', New Life, 5 February 1988; reproduced in Asian Herald, March 1988 and Daily Jang, June 1988. ‘Who is Defining Whom? ', New Society, 4 March 1988. ‘Equality Professionals and Ethnic Identity', Equal Opportunities Review, April 1988. ‘Asian Identity: the Current Debate', New Life, 12 August 1988. ‘Re: Satanic Verses', The London Review of Books, 18 May 1989. ‘Alabama Britain', The Guardian, 22 May 1989; reproduced in New Life, 9 June 1989. ‘A Response to Mr Rushdie's 'In Good Faith', The Independent, 5 February 1990. ‘Allowing us to be British' New Life and Leeds Other Paper, 4 May 1990; shortened version in The Guardian, 27 April 1990. ‘Muslims and Racial Equality', Muslimwise, May 1990. `Religion and the Social Order in Britain', Impact International, November 1992. ‘Reconciliation is An Issue of Public Policy', Faith and Reason series, The Independent, 30 January 1993. `The Facts and Panorama', Q-News, 2 April 1993.